“It’s been a surreal experience to be back in this way,” said five-time Olympic medalist Venus Williams. Venus and her sister, the 22 Grand Slam title winner Serena Williams, stood at a podium in the Leuders Park Court. The court was refurbished and dedicated to the sisters, being renamed the Venus and Serena Williams Court of Champions. This was the first time Venus and Serena returned to Compton in over a decade. Supervisor Mark Ridley-Thomas and Compton councilmember Isaac Galvan were also present in the court dedication. Venus and Serena expressed their appreciation to the people of Compton for their support through the years. They bestowed on the city the Yutunde Price Resource Center, named after their eldest sister who was a fatal victim of gun violence. The resource center will help people who were affected by violence and provide resources. 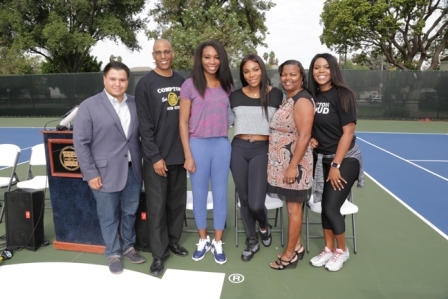 The Williams sisters also attended Healthy Compton, a festival encouraging the citizens in Compton to take advantage of healthy options. The festival also featured a track clinic by Olympic sprinter Carmelita “The Jet” Jeter. The Brutez, a fitness duo that administers fast paced dance classes, hosted a session for the children who attended Healthy Compton. Jeter, Mayor Brown, and the Williams sisters all joined, following the trendy, animated dance moves to the rhythm of hip-hop music. Among the many organizations that were featured in Healthy Compton was the Inner City Child Development Foundation, a non-profit organization that provides transitional housing, youth mentorship and free food programs. YG 4 Hunnid was also in attendance at Healthy Compton. The organization, started by rapper YG, work with Mayor Brown to help those in need. “We’re gonna stand behind [Venus and Serena] and try to make Compton more healthier,” said Shonee Jackson, mother of YG. The Williams sisters were well received by the citizens of Compton.